Women in their 40s are finding themselves lost in the black hole of soul-sucking careers, dead-end relationships, or simply that life has become too much like Groundhog Day. As a high-achiever, you know how to get things done. You set goals and achieve them. On the outside, you’re the picture of success. You know you should be proud of your accomplishments; but deep inside, you secretly feel disappointed. You feel lost, frustrated, and overwhelmed - something is missing, and you have no idea how to fix this. It can be terrifying to consider changing things up and you feel it’s too late to “start over”. But, I don’t believe it’s ever too late to find a life that makes you excited to get up in the morning. It's time to stop feeling stuck and take control of your life. YOU DON'T HAVE TO BECOME A NEW PERSON TO REINVENT YOUR LIFE. SOMETIMES THE SMALLEST CHANGES CAN OPEN THE BIGGEST DOORS. Did you know everyone experiences a midlife crisis? It’s not something for just men! Women go through this phase of life as well, but nobody talks about it, so most think they’re alone in what they’re feeling and experiencing. For women, it’s a period of waking up and realizing the life you’ve always known isn’t working for you anymore. It’s during this phase, when you start to realize something critical is missing from your life. It’s scary, frustrating, and makes you feel lost in everything that’s familiar. But, when you take action to face it head on instead of lashing out at everyone around you, or crying into your pillow every night, you get to take control and leave the crap behind. You uncover the power that’s already inside of you to redefine yourself. I don't call it a Midlife Crisis, I call it a Midlife Awakening! Let's pause for a minute and talk about the word "midlife." Most of us don't like that word and we may not even identify with it, but let's get something straight right from the start: MIDLIFE ISN'T ABOUT A NUMBER. 'Midlife' isn't a reward after celebrating a significant milestone birthday. Midlife is about hitting that transition period where we no longer feel “young”, but we definitely don’t feel “old.” Midlife is nothing more than the phase where we shed our old selves, and reawaken as new, improved, and a hell-of-a-lot better! They've been on many different journeys to get clear on what’s not working for them to uncover what’s missing (and why that missing piece is so important to them!) so they could align how they’re living with who they are. I’ve worked with a corporate mom building a side hustle, an executive searching for a new career option, a former nurse seeking a passion project, and a single teacher reconnecting with her love for education (just to name a few!). I focus on CLARITY, EMPOWERMENT, and ACTION. I want you to get curious about your life, believe in yourself, and then act on it! Vicky is the perfect combination of gentle guide, compassionate coach, and "I've been there, you can do this" confidant. Watching her navigate her Midlife Awakening with such courage, grace and embracing of the unknown has been incredibly inspiring. If you need a steady hand to help you sort out the next step of your journey -- I highly recommend working with Vicky. I’m Vicky and my mission is to inspire women, like you, to speak up about what they’re really feeling, be honest with themselves on what they truly want, and be brave enough to do what it takes to create the life they crave. It’s hard to make changes and I know this from first hand experience. As a 40+ professional woman, I know the fear that comes with realizing the life I had carefully created for myself wasn’t fulfilling me or making me truly happy. When we work together, I partner with you on your goals and getting you where you want becomes my mission. Vicky is a fantastic coach! She is so kind and makes you feel comfortable immediately. She gives you the space to be vulnerable without judgment. Vicky listens deeply and is good at helping you unearth the story under the one you've been telling yourself. She helps you reframe how you're looking at things, plus gets you into action so that you're not just stuck there in your thoughts, but actually work towards the things you want to achieve. 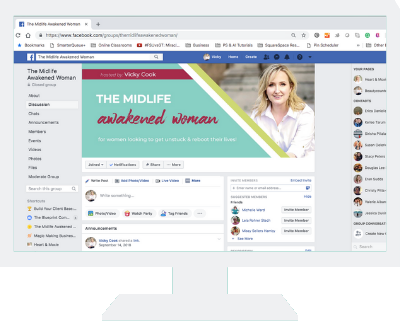 I'd highly recommend Vicky to women who are looking to get unstuck and start living the lives they dream of. Tired of doing the same thing every single day? 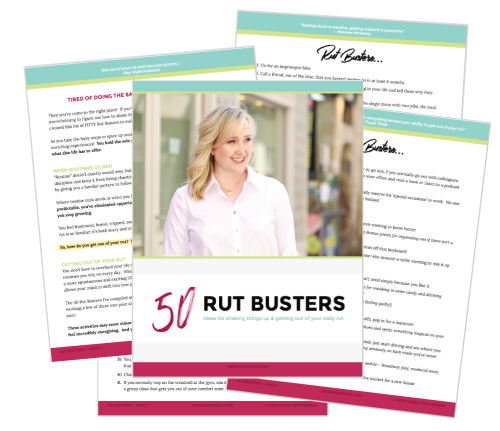 Join my email community and get this BONUS guide to bust otta your rut: pick from FIFTY ideas to shake things up, get off the hamster wheel, and start experiencing your life!